Our range of products include sealed unit & steel plated tension flanges pressure gauge, pressure gauges, bourdon gauge, diaphragm gauge, diaphragm gauges (compact capsule pressure gauge) and industrial gauge. 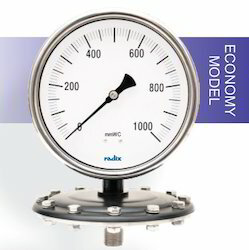 Radix Economy Sealed Gauges are low cost hygienic sealed diaphragm pressure gauges, designed to be used in corrosive environments. A Teflon-sheeted SS316L diaphragm protects the pressure gauge from corrosive media and also prevents clogging of the bourdon tube by viscous process media. These diaphragm pressure gauges are primarily used in applications where the process fluid measured would normally clog the pressure measuring device or where the process fluid in the measuring element might freeze due to changes in ambient temperatures. Built with stainless steel / black powder-coated tension flanges, the cup type tension flange design supports pressure measurement up to 14 kg/cm3. The sealed unit of this gauge can be unbolted for cleaning the diaphragm during maintenance and can be used for positioning the pressure gauge during installation. With an IP68 rating (IS/IEC 60529:2001), PGS200 series Pressure Gauges are completely dust proof and can handle complete continuous submersion in water. These gauges are built with a complete stainless steel casing and stainless steel internals. They can also be glycerin filled or with an extension capillary. Radix Bourdon Pressure Gauges are designed for pressure measurement in corrosive environments and gaseous or liquid media that do not obstruct the pressure system. They are often utilized in Chemical Processing, Petroleum Refineries, Petrochemical plants, Fertilizer plants, Thermal and Nuclear Power Generation amongst other process applications. The PGB series measures pressures up to 1000 kg/cm2. Our Bourdon pressure gauges are constructed completely of stainless steel to make them virtually immune to rust, corrosion and stains. Along with high load cycle stability and superior shock resistance, they are more durable and have a longer life. With an IP68 rating (IS/IEC 60529:2001), these pressure gauges are completely dust proof and can handle complete continuous submersion in water. The wetted parts are made of SS304, SS316 or SS316L stainless steel. Radix offers multiple options in dial size for different accuracy requirements as well as readability from various distances. PGB301 is a Glycerine Filled model that reduces the impact of vibration or pulsations on the pressure gauge. Wetted parts are made of stainless steel- SS304 / SS316 / SS316L. We are leading Manufacturer of Bourdon Gauge and our product is made up of good quality. These type of Bourdon pressure gauges have a complete stainless steel construction which makes it immune to rust, corrosion and staining. 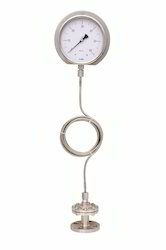 Suitable for measuring pressures of non corrosive gases and liquid media.These gauges have high load cycle stability and shock resistance. IP68 rating offers a dust tight weatherproofing and protection from complete, continuous submersion in water. This range of pressure gauge is available for pressure ranges up to 1000 Kg/cm2. Multiple dial size available depending on accuracy (to register even small changes) and readability (comfortably note values from a distance). These pressure gauges are used in Chemical Processing, Petroleum Refinery, Petrochemical, Fertilizer, Thermal & Nuclear Power Generating Industry and Process Applications. Radix Low Pressure Diaphragm Gauges are designed for low pressure measurement of non-corrosive gases.These gauges are widely used for low pressure applications in commercial heating, gas distribution and filtration systems. 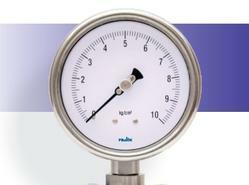 PGD500 gauges measure pressures up to 1000 mbar. An SS316L diaphragm gives the pressure gauge superior protection from external conditions and ensures high quality pressure readings. With an IP68 rating (IS/IEC 60529:2001), PGD500 gauges are completely dust proof and can handle complete continuous submersion in water. PGD600 Compact Capsule Pressure Gauges are designed for very low pressure applications in non-corrosive gases. They are widely used in commercial heating, gas distribution and filtration systems. 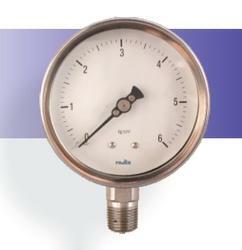 The compact capsule pressure gauges measure low pressures up to 600 mbar. Compact, lightweight and easy to install, PGD6 gauges have an IP68 rating (IS/IEC 60529:2001), making them completely dust proof and waterproof even under complete continuous submersion. The diaphragm material is generally SS316L. PGD600 is built with a stainless steel (SS) case and internals, while PGD610 has an SS case and copper alloy Internals. We are leading Manufacturer of Industrial Gauge and our product is made up of good quality. Suitable for corrosive gases and liquid, also viscous media. Radix Sealed Diaphragm Gauges are designed for accurate pressure readings in high pressure corrosive environments. A Teflon-sheeted SS316L diaphragm protects the pressure gauge from corrosive media and also prevents clogging of bourdon tube due to viscous process media. The PGS300 gauges are meant for high pressure requirements measuring up to 210 Kg/cm2. These sealed diaphragm pressure gauges are primarily used in applications where the process fluid being measured would normally clog the pressure measuring device or where the process fluid in the measuring element might freeze due to changes in ambient temperatures. With an IP68 rating (IS/IEC 60529:2001), PGS300 series are completely dust proof and can handle complete continuous submersion in water. These gauges are built with a complete stainless steel casing and stainless steel internals. They can also be glycerin filled or with an extension capillary. 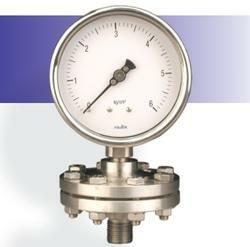 We are leading Manufacturer of Industrial Gauges and our product is made up of good quality. These pressure gauges are used in Chemical Processing, Petrochemical, Petroleum Refinery, Fertilizer, Thermal & Nuclear Power Generating Industry and Process Applications. Series 100.000 type Bourdon pressure gauges have a complete stainless steel construction which makes it immune to rust, corrosion and staining. 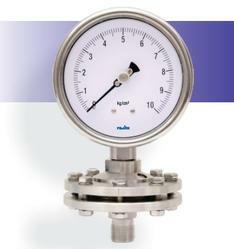 Suitable for measuring pressures of non corrosive gases and liquid media. These gauges have high load cycle stability and shock resistance. IP68 rating offers a dust tight weatherproofing and protection from complete, continuous submersion in water. This range of pressure gauge is available for pressure ranges up to 1000 Kg/cm2. Wetted parts are made of stainless steel- SS304 / SS316 / SS316L. Multiple dial size available depending on accuracy (to register even small changes) and readability (comfortably note values from a distance). Wetted parts are made of stainless steel- SS316L / SS316 / SS304. This series, Bourdon pressure gauges have a complete stainless steel construction which makes it immune to rust, corrosion and staining. Suitable for measuring pressures of non corrosive gases and liquid media.These gauges have high load cycle stability and shock resistance.IP68 rating offers a dust tight weatherproofing and protection from complete, continuous submersion in water. 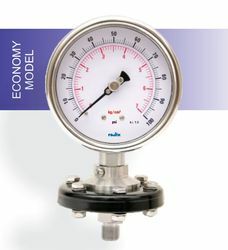 This range of pressure gauge is available for pressure ranges up to 1000 Kg/cm2. Wetted parts are made of stainless steel- SS304 / SS316 / SS316L. Multiple dial size available depending on accuracy (to register even small changes) and readability (comfortably note values from a distance). Wetted parts are made of stainless steel- SS316 / SS304 / SS316L. Radix introduces PGB300 series, our Bourdon type pressure gauges designed for pressure measurement in non-corrosive environments and gaseous or liquid media that do not obstruct the pressure system or any of its copper parts. Our Bourdon gauges are built after giving due consideration to international standards for durability, accuracy and quality of workmanship. Thismakes them highly suitable for usage in Medical engineering, HVAC and Pneumatic applications. 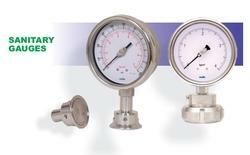 These gauges measure pressures in the range of 0 to 1000 Kg/cm2. Liquid is filled to dampen vibration in certain types of loads. Radix Sealed Diaphragm gauges are designed for accurate pressure readings in high pressure corrosive environments. A Teflon sheeted SS316L diaphragm protects the pressure gauge from corrosive media and also prevents clogging of the bourdon tube by viscous process media.. The PGS400 gauges are meant for high pressure requirements measuring up to 280 Kg/cm2. These sealed diaphragm pressure gauges are primarily used in applications where the process fluid measured would normally clog the pressure measuring device or where the process fluid in the measuring element might freeze due to changes in ambient temperatures. With an IP68 rating (IS/IEC 60529:2001), PGS400 gauges are completely dust proof and can handle complete continuous submersion in water. 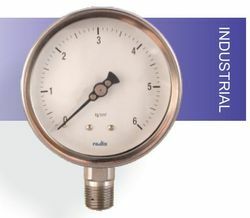 With a strong welded steel constructions, the gauges can be directly mounted using their threaded process connection. 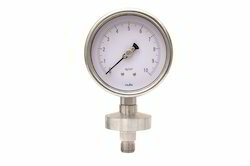 These gauges are built with a complete stainless steel casing and stainless steel internals. They can also be glycerin filled or with an extension capillary. 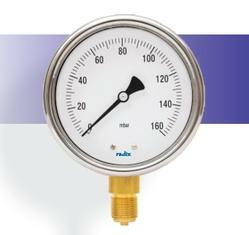 Radix Sanitary Pressure Gauges are designed for applications with high hygiene requirements. They are constructed with a hygienic SMS seal connection, which permits easy detachment without compromising hygiene in the system. PGF400 gauges can measure pressures in the range of 0 to 42 Kg/cm2.SS316L Diaphragm seals isolate the sensing element of the pressure gauges from process fluids which may be corrosive, viscous or containing sediments. These sanitary gauges are found operating in Pharmaceutical, Biotechnology, Food, Beverages and Dairy applications. With an IP68 rating (IS/IEC 60529:2001), PGF400 gauges are completely dust proof and can handle complete continuous submersion in water. PGF401 is a Glycerine Filled model that reduces the impact of vibration or pulsations on the pressure gauge. Cost Effective Air Flow Station for Ducts up to 60Once installed and connected to a suitable measuring instrument, the device will provide years of trouble free monitoring of both air and gas flow. Installing the AFG Flow Grid is quick and easy, the AFG is supplied in kit form to allow both workshop and on-site installation into a wide range of square and circular ducts up to approximately 60. Weight:AFG-1: 1 lb (454 g); AFG-2: 3 lb (1361 g). Lightweight, Durable, & Easy to InstallThe Model DAFM Duct Air Flow Measuring Probe uses evenly distributed total and static pressure measuring points to deliver an accurate measurement of flow in a duct. These air flow measuring probes may be ordered for either round or rectangular ducts. With its lightweight and durable construction in addition to its ease of installation, this product lends itself to being used in the HVAC industry. These air flow measuring probes may be ordered for either rectangular or round ducts. 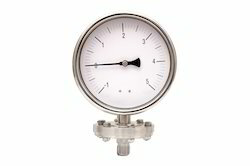 Looking for Pressure Gauges ?